The phrase “Hellenistic astrology” has come to be used in contemporary historical discussions to designate a tradition of astrology that appeared in the Mediterranean region during the 1st century BCE, and then was practiced in something closely resembling its original form until about the 6th or 7th century CE. While there are debates about what led to the development of this specific form or tradition of astrology, and to what extent its appearance represents a sudden ‘invention’ or a gradual development that took place in the late Hellenistic period, it is clear that by the latter half of the 1st century BCE the system had been developed and it was being widely practiced in Rome and Egypt, particularly in Alexandria. The earliest ‘horoscopic’ charts date to this period in the 1st century BCE, and there is a marked upsurge in chatter in the non-astrological literary sources that indicates that ‘nativity casting’ (γενεθλιαλογία) had suddenly come into vogue with the Roman intelligentsia. Eventually the popularity of this new tradition of astrology crested and peaked during the 2nd and 3rd centuries CE, the period from which most of our extant birth charts date to, and then it went into decline due to the fall of the western Roman empire in the 5th century as well as increased Christian opposition in the Eastern Empire. The technical terminology of this new form of astrology was rooted in the Greek language, and although the majority of its practitioners were not necessarily ethnic Greeks themselves, the majority of the astrological manuals from this period were written in Greek. The justification for dating the end of the Hellenistic tradition of astrology to the 6th or 7th century rests on the grounds that this is the period from which some of the latest surviving Greek astrological texts exist, still being largely untouched by new innovations and the synthesis of other astrological traditions that was to occur during the early Medieval period, with the great flourishing of astrology that occurred under the Arabian astrologers of the 8th and 9th centuries. The importance of Rheorius the Egyptian (Ῥητόριος ὁ Αἰγύπτιος), or Rhetorius of Egypt, as he is sometimes known, is that he wrote one of the latest, if not the latest, major Hellenistic astrological treatises that has survived into the present time. Thus, the 6th or 7th century dating for the end of the Hellenistic tradition of astrology is partially based on Rhetorius himself, who is essentially used as the bookend for this tradition. However, the entirety of his extant text has never been translated into English, or any modern language as far as I am aware, until now. The book is a translation of the entirety of Rhetorius’ Compendium, which was written in Greek with approximately 118 separate chapters or sections. Holden’s translation is primarily based on different pieces of the Compendium that were edited and published at different points in the Catalogus codicum astrologorum graecorum during the course of the first half of the 20th century.1 Holden had apparently completed three previous editions of this translation in 1985, 2000 and 2005, but they were only circulated privately, and now for the first time he has published his entire translation of the work, already in its fourth edition. Holden attached each separate translator’s preface that he penned at the time of the release of the four separate editions of his translation. In the process of reading them one gets a sense of how long he has been working on and revising the present translation, as well as how long he has been waiting to, but was unable to complete it. In the initial 1985 preface he expresses his anticipation of a new critical edition of the Greek text of Rhetorius that Pingree was said to be working on. Then, 15 years later in the 2000 preface to the second edition, he somberly notes that Pingree’s edition had still not yet appeared, but he was still hopeful that it might eventually. In the preface to the third edition in 2005 he expresses that he simply needs the Greek text of three of the later chapters from the Compendium in order to complete the translation, and while Giuseppe Bezza had been kind enough to send him photocopies of the actual manuscripts, his lack of background in paleography and the illegibility of the Greek text made a complete translation of those chapters all but impossible. Additionally, he says that while he was able to meet with Pingree and speak about his “long-awaited edition of Rhetorius” at a conference in 2004, and Pingree expressed that he had found some much more legible manuscripts of those chapters of Rhetorius, there was no hint of when the publication date might be. In the preface to the current published edition we learn that it was not until December of 2008 that Holden obtained the missing chapters that he needed from Stephan Heilen, who over the last few years since Pingree’s death in 2005 has taken on the task of bringing his critical edition of the Greek text of Rhetorius to completion. In relaying this story one can almost sense an audible sigh of relief issuing from Holden, who is now finally able to bring a translation that he has been working on for more than two decades into the light of day. Rhetorius’ Compendium is primarily a compilation and a synthesis of the doctrines of earlier Hellenistic authors, with some commentary and other explanatory material added in by Rhetorius himself. Thus Holden’s translation of the title ‘Astrological Compendium Containing His Explanation and Narration of the Whole Art of Astrology‘. The work is not only a compilation of material from different Hellenistic authors, but it is also Rhetorius’ own explanation and narration of many of the concepts and techniques that he found. The first 50 brief chapters define basic concepts and terms used in Hellenistic astrology, and most of the material in these chapters has been excerpted by Rhetorius from an earlier author named Antiochus of Athens. The second half of the work draws material from a variety of other sources, including Dorotheus, Critodemus, Anubio, Teucer of Babylon, Vettius Valens, Ptolemy, Porphyry, Paul of Alexandria, Anonymous of 379 (possibly) and Julian of Laodicea (possibly), as well as other authors that are embedded in those sources. Ultimately while Holden may be correct in raising the possibility that this could be a hypothetical chart rather than an actual nativity, its not really clear whether that is actually the case. On the one hand it is not uncommon for astrologers to use hypothetical charts, sometimes even with astronomically impossible scenarios, as is the case with some of Guido Bonatti’s example charts. On the other hand, just because Rhetorius left out the ascendant and didn’t mention any details about the native’s life doesn’t necessarily mean that it must be a made up chart. While it would appear that Holden may have more evidence going for him in arguing for a 6th century dating of Rhetorius, and in some ways this would fit the time line of Hellenistic astrology a bit better by making Rhetorius less of an outlier, it still seems as if this is an open issue that will have to be settled through other means, if indeed it can be settled at all. My overall opinion of the book is quite positive. Holden did an excellent job in striking a balance between making the translation readable while at the same time attempting to stay true to what Rhetorius wrote. Holden’s commentary and footnotes are very useful in helping to explain concepts contained in the work, as well as some of the problems that he and the editors of the manuscripts dealt with in translating certain sections of the received text. The appendices are an added bonus, particularly the chapters from Teucer of Babylon on the significations of the planets and the signs, which help to round out the book and make it into a rather complete overview of basic Hellenistic astrological doctrine. I had some issues with some of the choices that were made in adopting or not adopting certain translation conventions for specific technical terms. For example, I was perplexed as to whey Holden decided to leave the Greek term ‘doryphory’ transliterated instead of translating it with the literal meaning of ‘spear-bearing’ or ‘attendance’. Since Holden does actually mention in a footnote that this is what the term means, I don’t quite understand the decision to leave that particular term untranslated. Along those lines, I would have preferred that the literal terms ‘right’ and ‘left’ were used instead of the more archaic ‘dexter’ and ‘sinister’, despite some of the earlier 17th and even 20th century astrological conventions. I realize that it is a pretty tough line to walk in deciding when to adopt new conventions and when to stick to more established ones though, and Holden was clear enough in his introduction that he was going to try to stick with more established modern conventions when possible. Thus, for example, the reason that he consistently uses the term ‘house’ instead of the more literal term ‘place’ for the Greek ‘topos‘, despite the conceptual differences. Holden simply seems to have been trying to leave some room open for the possible nuances in the word katarche. Still, I think that it would have been better to have footnoted this issue, because inserting the words ‘horaries’ and ‘elections’ next to each other like that in the translation could lead the casual reader towards some false assumptions about the Hellenistic tradition. This a subject that I dealt with at length in my paper on the origins of horary astrology, although I realize that my conclusions on that matter are far from universally accepted at this point, and in some ways Holden’s rendering of the term katarche here is in keeping with the prevailing notions. On page 7 I believe that Holden mistranslated the statement that “the Moon is the Fortune of all” (τὴν Σελήνην τύχην τοῦ παντός). His translation states that ” the Moon is the fate of all”, but the problem with this is that the term that he translated as “fate” is tuche, which usually means “fortune” in the Hellenistic literature, such as the ‘Lot of Fortune’ or the ‘Place of Fortune’. The term used for fate is usually heimarmene, not tuche. Given the frequent associations between the Moon and the concept of Fortune in the Hellenisic tradition, I see no reason to have rendered tuche as ‘fate’ in this instance. Lastly, in CCAG 8, part 1 there is an excerpt from Rhetorius in which he outlines a general method for the examination of the chart based on a synthesis of earlier authors such as Dorotheus, Potlemy, Valens, etc., even referencing some of the time-lord techniques used by those authors. This section was translated by Robert Schmidt in 1995 in The Astrological Record of the Early Sages in Greek. It is somewhat similar, at least in its purpose, to the passage that Holden translated as chapter 54 on the ‘Topical Examination of the Horoscope’, although they seem to outline different approaches. It is not clear why Holden didn’t include this section in his translation. The Moon’s nodes are much more integrated into Rhetorius’ system than is evident in earlier Hellenistic authors. While there are some traces of how the nodes were used or thought of by authors such as Valens, in Rhetorius they appear to be applied in delineations much more frequently and systematically. This raises questions for me about whether the evidence in Rhetorius is indicative of changes that took place in the Hellenistic tradition by the 6th or 7th century, perhaps due to influence from the Persian or Indian traditions, or conversely if Rhetorius is simply preserving earlier doctrine about the nodes that isn’t represented as well by the other surviving authors. Similarly, the concept of ‘detriment’ is likewise more prevalent in Rhetorius’ work than it is in earlier Hellenistic authors. Again, while ‘detriment’ is mentioned or alluded to by some earlier authors, such as Serapio and Valens for example, in Rhetorius it appears to be applied much more systematically and overtly. Again though, it isn’t clear if this means that there were changes that took place in the tradition between the earlier authors and Rhetorius, or if Rhetorius is simply reflecting older doctrine, since his work is of course primarily a compendium of older material – albeit older material that has been revised or updated in some instances. In footnote 3 on page 120 Holden notes close parallels between Rhetorius and Ptolemy, although he points out that the usage of non-Ptolemaic concepts implies that Rhetorius was drawing on a common source that was also available to Ptolemy, rather than simply paraphrasing or excerpting from Ptoelmy directly. The implications of this are, perhaps, that Ptolemy didn’t deviate as far from the mainstream Hellenistic tradition as it sometimes appears, or indeed as Holden himself has sometimes argued that he did.3 Holden’s argument is still more or less accurate, and the rejection of the centuries old idea of Ptolemy as the fountainhead of Classical astrology was an important realization to make in the process of recovering the Hellenistic tradition, although with more and more sources becoming available it strikes me that it is time for a more in-depth study into what Ptolemy actually did, and what the areas of convergence and divergence are with the rest of the tradition in his astrological work. That is to say, to what extent was Ptolemy being faithful to the technical and conceptual tradition, and to what extent was he not? With this translation of Rhetorius Holden may have provided us with a very valuable key for finally answering this question. Holden’s translation of Rhetorius’ Compendium is an important contribution to the field of ancient astrology, both for the historian and the practicing astrologer. 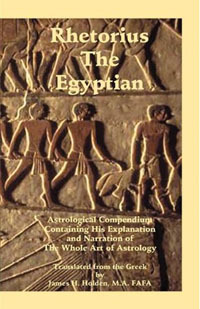 Anyone who wishes to study the Hellenistic tradition will eventually have to come to terms with this text, and in fact the book makes for a rather useful and comprehensive introductory volume for new students of Hellenistic astrology due to the inclusion of the material from Teucer of Babylon with the other definitions and delineation material. I would highly recommend the book to anyone who has an interest in pursuing the study of ancient astrology, and I am personally thankful to Holden for having translated and published it. I’m wondering, wasn’t “tyche” the Greek word for “Fortune”? Although both of them (“tuche” and “tyche”) doesn’t seem to differ too much. Yes, its just a matter of how you transliterate upsilon. I was simply transliterating it here with a ‘u’ instead of a ‘y’.